Use the Exchange Server connector in System Center 2012 Configuration Manager when you want to manage mobile devices that connect to Exchange Server (on-premises or online) by using the Microsoft Exchange ActiveSync protocol, and you cannot enroll them by using Configuration Manager. 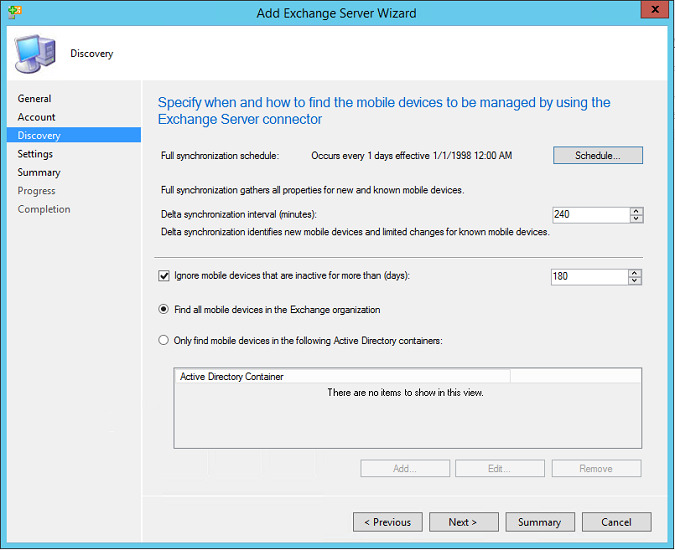 When you manage mobile devices by using the Exchange Server connector, this does not install the Configuration Manager client on the mobile devices. Some management functions are therefore limited. For example, you cannot install software on these devices or use configuration items to configure these devices. For more information about the various management capabilities that you can use with Configuration Manager for mobile devices, see Determine How to Manage Mobile Devices in Configuration Manager. Before you install the Exchange Server connector, confirm that Configuration Manager supports the version of Microsoft Exchange that you are using. For more information, see Supported Configurations for Configuration Manager. A user’s mobile device appears in the Application Catalog automatically when the Exchange Server connector manages it and the Exchange Server is on-premises. 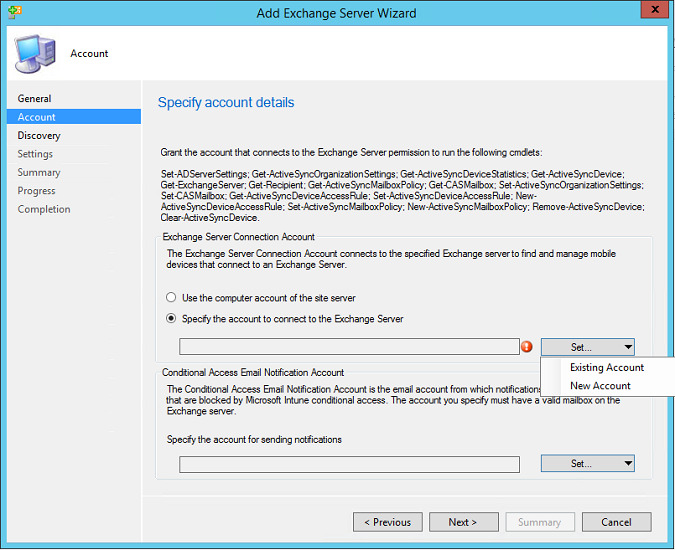 When you configure the Exchange Server connector for Microsoft Exchange Online, you must manually configure user device affinity for the user’s mobile device to appear in the Application Catalog. For more information about how to manually configure user device affinity, see How to Manage User Device Affinity in Configuration Manager in the Deploying Software and Operating Systems in System Center 2012 Configuration Manager guide. For more information about how to configure security permissions, see Configure Role-Based Administration. On the Home tab, in the Create group, click Add Exchange Server to open the Add Exchange Server wizard. On the General page, specify the address of your On-premises Exchange Server. 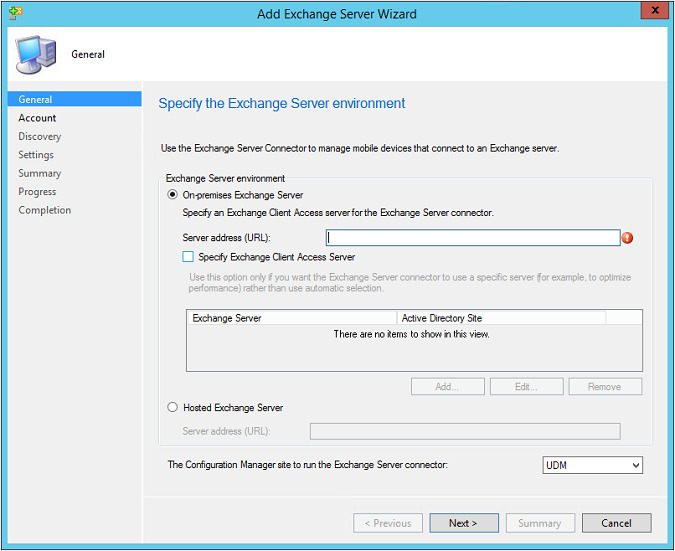 Select Specify Exchange Client Access Server if you want to limit user discovery to a specific Active Directory forest. For the Exchange Server Connector Account, specify the administrator account that you configured to run the Exchange Server PowerShell cmdlets. In the Specify the account for sending notifications field, set the account that will be used to send quarantine email notifications to clients that are blocked by Configuration Manager conditional access. The account you specify must have a valid mailbox on the Exchange server. You must specify this account. Otherwise, conditional access will fail. For more information, see Conditional Access in Configuration Manager. Specify when and how mobile devices are discovered and managed. 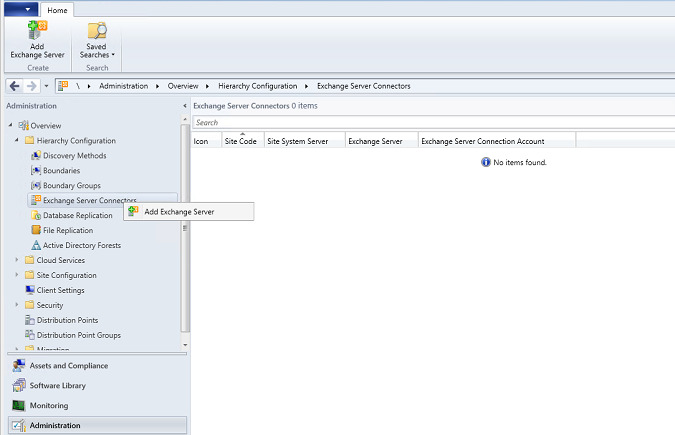 - Set the number of minutes that pass before the Exchange connector queries the Exchange Server for device connections that have been discovered since the previous full synchronization (default 240). - Specify the number of days that a mobile device must be inactive before the exchange connector will remove its entry (default 180). - Specify whether the exchange connector will discover all devices (the default) or just those in a specified organizational unit. You can click **Add** to select an Active Directory collection of users to be targeted with conditional access. You can edit the Exchange ActiveSync policies already deployed on the Exchange Server, such as password length and complexity. Any edits you make to the policies on this page of the wizard will override existing EAS policies. 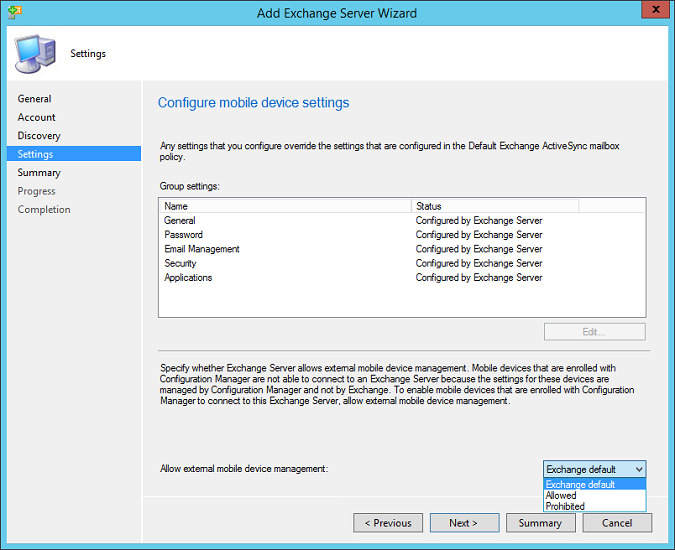 You can also enable the option External mobile device management to ensure that the mobile devices continue to receive email from Exchange after Configuration Manager enrolls them. We recommend that you set this option to Allowed. Review the settings on the Summary page and then click Next to complete the installation of the Exchange Server Connector. You can verify the installation of the Exchange Server connector by using status messages and by reviewing the log files.